Do you like practicing yoga and energy healing? Are you a teacher/practitioner thirsty for knowledge? Do you wish to be or are you relaxed, grounded and energetic? Would you like deep healing and transformation? If you answered yes to any of the above and are willing this retreat is for you!! This retreat will only cater for 12 people making a strong core group. Villa Selina is an Eco Resort in the north of Bali. Located in a small cultural village of Bondalem on the north east coast it is surrounded by coastline and jungle. It is a great place to experience the real Bali. We have excursions related to each chakra, practicing yoga and meditation under waterfalls, in temples, hot springs and ancient forest. Feast at the markets on the digestive chakra and climb Mount Batur, one of Bali's highest mountains at 2am for the highest chakra - Sahasrarah, where we will meditate as the sun rises atop the mountain peaks. ​You will stay in unique jungle eco-lodges to appreciate the tropical space where you can connect and transform your wellness through good food and good company. Guided by an truly experienced instructor, this retreat will bring you back to your purest essence! This is a truly specialised retreat. Let Natalie guide you into deep meditations allowing you to reset your vibe. Learn a style of yoga that will increase the flow of lymph and blood and energy ten fold. As the fluids flow and energy moves you will clean and reprogram your cells, transforming old patterns to enhance your choices of today. Revibe with sound, recreate through visualisation, rejuvenate as you stretch and massage, move in a gentle yet strong yoga style 'alchemy '. Remember there is an immense amount of power in gentleness. Some practices will be physically soft and flowing as we fuse yoga with tai chi movement, encouraging the flow of energy. Other practices will be physically strong working with our deep innermost core - our Soul, to activate the endocrine system. Yoga - Alchemy Style, only 5 teachers in the world. Chi Kung - energetic and breathing practices. Meditation - silent, walking and sound. Exploration through questioning and theory. Energy work - learn to feel it in your hands and throughout the body, directing it where needed. Then move to your outer layers. Non-invasive partner stretch and massage in a friendly and supportive environment as we create assisted healing. Fun exercises to release pent up energy. The universal chakra system and it's intervention with the endocrine system. Elements of life - co-relating with the digestive system and emotions. The Three Essences (Body, Soul, Spirit) of everything living and how this balances the pH system. Respect the silent mornings, this is a time to process and awaken your own mind. Be aware of each other's space. Receive a free recording of one of the guided meditations practiced on retreat. Villa Selina is an Eco Resort in the north of Bali. Located in a small cultural village of Bondalem on the north east coast it is surrounded by coastline and jungle. It is a great place to experience the real Bali. There are magical waterfalls, hot springs and great diving on the reefs. The villa has many chill out areas and you can relax as you listen to the waves lapping the shore. Unwind and let the sea breeze take your cares away. A leisurely 3 hour drive from Kuta, 1 hour from Amed, 1 hour 20 mins from Ubud and 1 hour from Lovina. A steady stream of customers who have left dozens of reviews about how tasty the food is. The main eating area is attached to the main Villa, weather permitting we have alternate dining locations on the front seawall that overlook the beach and Bali Sea. I can’t recommend this place enough. It was awesome!! The owners were kind and helpful. Their place is a beautiful garden right on the sea shore. There’s good enough waves for surfing, excellent for beginners and the owner has a selection of boards to borrow. Nice and spacious bungalows, great breakfasts, friendly support on every question or special request. We did a lot of diving directly in front of the resort we had a lot of fun and found many animals. Great for beginners and macro photographers. Includes food at resort, twin share accommodation, transfers from Seminyak to Bondalem return and all retreat classes: approximately 4 per day. Pay in full by February 28 and receive 10% discount. Ensure your place by making a non-refundable deposit of $400 paid by March 28, 2018. This retreat holds a maximum of 14 people so book ASAP. For cheap flights subscribe to I Know The Pilot. Arrive 25th May. 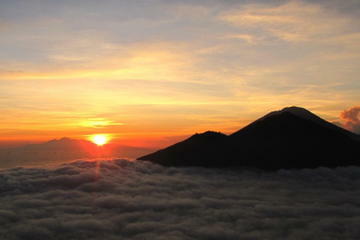 Stay in Seminyak overnight: Enjoy a Morning Yoga Session then we bus share to Bondalem with a stop at the Holy Springs. Retreat finishes the 1st June and we depart Bondalem on June 2nd. Yoga Schedule and tours at bottom of page. The retreat runs on an approximated schedule as the group mind and energy changes. ​-Friday May 25th - Arrival and Introduction - An evening to unwind and adjust. Arrive Denpasar Airport, make your way to Seminyak where we will stay overnight (at an extra cost of $55 includes breakfast). -Saturday May 26 - Mooladhara Chakra - Earth Element - "Travel to Bondalem and absorb the culture of Indonesia along the way". *7am: Early morning yoga session then transfer on 3 hour bus ride to Bondalem (included in cost) with a stop on the way at Kintamani or Bedagul, Holy Springs. *4pm - Arrive Bondalem for a swim and a yoga session. -Sunday May 27 Swadhistana Chakra - Water Element - "Take a gentle walk to the waterfalls and cleanse"
*7.00am - Morning in silence, Meditation and Internal Exercise (bandhas and pranayama for the endocrine glands and chakras. -Monday May 28 - Manipura Chakra - Fire Element - Digestion - "Indulge in the divine Indonesian treats, chew properly!!" *7.00am - Silent Zen walking Meditation and Internal Exercises. -Wednesday May 30 - Vishudhi Chakra - Wood Element - "Soul of the soul" , Celebrate full moon to release the soul of unwanted patterns"
-Thursday May 31 - Ajna Chakra - Ether - "Visit Holy Places as we open our holy chakra of oneness"
-Friday June 1 - Sahasrarah chakra - Consciousness - "Climb to great heights on the highest chakra"
10am Depart Bondalem to Denpasar. Teaching the Internal Alchemy of Yoga. ​Natalie Almond is an intuitive, yoga teacher and healer with extensive knowledge on many of our systems. She channels the energy in the room, giving all students something they need. Natalie's teaching is fun and informative taking you to a deeper level. She has worked with stress, anxiety, depression, AIDS, chronic fatigue, addiction and much more. Natalie healed herself of chronic illness through yoga, herbs and treatments and visualisation. Natalie has taken an interest in yoga, energy and the healing arts from a young age, since Swami Sarasvati taught on television. She began her journey of yoga and healing 28 years ago, encouraged by her own need to heal physically, emotionally and spiritually with success!. She has a strong desire to share her knowledge in a simply fun and easy to understand manner. Natalie’s innate ability to weave energy creates a comfortable connection between peers on retreat giving depth within the group mind to heal and transform. Her guided meditations are exquisite and deeply transformational. Thanks Nat, great workshop as always), you hold a really inspired space, your so easy to drop down into relaxation with or into some invigorating, challenging yoga. You also make everything fun, intuitive and intelligent as we all learn greater ways to evolve and live in better health. Just wanted to thank you Natalie for the retreat, you shared and gave so much, also the food was soooo wholesome and delicious!!! I have noticed some changes within me and it feels good. I have been feeling happier ever since, a bit flat today but I know that's just the mind. I am waking up at 6.30 every morning and going for a walk and doing my breathing exercises and mental quietness before work. I think doing this this at the retreat three days in a row changed my old habits. Loved it Nat! Smile and giggle as thoughts of retreat come up....we had a great time. Learning so much from you and the classes. I did the digestion meditation earlier...amazing and now im feeling very excited and special with this addition....thank you so much. What are your May dates for Bali? Thinking of this one too.... if I find cheap flights...!